With Pat & Cristina away, guest host Dr. Michael Thompson steps in to join the crew! Adam gives us a whiff of aromatherapy, specifically multi-level marketing company doTerra Essential Oils. Michael offers some historical context around the Tiananmen Square protests of 1989. Finally, Darren touches upon phototropism and whether sunflowers follow the sun. Cheng, Chu-yuan. Behind the Tiananmen Massacre: Social, Political, and Economic Ferment in China. Boulder, Colorado: Westview Press, 1990. Cheng, Pei-kai, Michael Lestz, and Jonathan D. Spence, eds. The Search for Modern China: A Documentary Collection. New York: W.W. Norton & Company, 1999. Ding, Yijiang. Chinese Democracy after Tiananmen. Vancouver: UBC Press, 2001. Esherick, Joseph W., and Jeffery N. Wasserstrom. “Acting Out Democracy: Political Theatre in Modern China.” The Journal of Asian Studies 49 (1990) 835-865. Guang, Lei. “Elusive Democracy: Conceptual Change and the Chinese Democracy Movement, 1978-79 to 1989.” Modern China 22 (1996): 417-447. Guthrie, Douglas J. “Political Theatre and Student Organizations in the 1989 Chinese Movement: A Multivariate Analysis of Tiananmen.” Sociological Forum 10 (1995): 419-454. Han, Minzhu, ed. Cries for Democracy: writings and Speeches from the 1989 Chinese Democracy Movement. Princeton: Princeton University Press, 1990. Harrison, J. Frank and Mok Chiu Yu, eds. 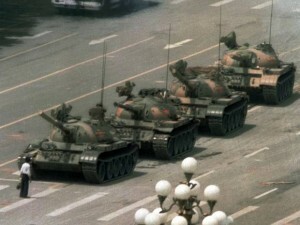 Voices From Tiananmen Square: Beijing Spring and The Democracy Movement. Montreal: Black Rose Books, 1990. Kwong, Julia. “The 1986 Student Demonstrations in China: A Democratic Movement?” Asian Survey 28 (1988): 970-985. Link, Perry, and Andrew J. Nathan, eds. The Tiananmen Papers. New York: Public Affairs, 2002. Oksenberg, Michel, et al., eds. Beijing Spring, 1989: Confrontation and Conflict: The Basic Documents. New York: M. E. Sharpe, 1990. Saich, Tony. The Chinese People’s Movement: Perspectives on Spring 1989. New York: M.E. Sharpe, 1990. Wagner, Marsha L., and Winston L. Y. Yang. Tiananmen: China’s Struggle for Democracy: Its Prelude, Development, Aftermath, and Impact. Baltimore: University of Maryland, 1990. Wasserstrom, Jeffrey N. Student Protests in Twentieth-Century China: The View from Shanghai. Stanford: Stanford University Press, 1991. Zhao, Dingxin. The Power of Tiananmen: State-Society Relations and the 1989 Beijing Student Movement. Chicago: University of Chicago Press, 2001. Do Sunflowers Track The Sun? This entry was posted in The Reality Check Episodes and tagged 1989 protests, aromatherapy, china, critical thinking, democracy, doTERRA Essential Oils, multi-level marketing, phototropism, skepticism, sunflowers follow sun, Tiananmen Square. Bookmark the permalink. 3 Responses to TRC #352: doTerra Essential Oils + Tiananmen Square + Do Sunflowers Track The Sun? Just getting into this week’s episode. There certainly are a lot of citations to back up your items, that’s awesome. WRT the essential oils, you mentioned a database of natural products, where do you access this? Sounds like something that might be interesting to look into. Also, when checking the claims of the company, it would be interesting to look at others selling the product to see if the statements are consistent. If so, it may be a marketing plan by the company in general to get the front line sellers to make the claims so the main company has deniability . I’ve seen this with friends and family involved in MLM’s. Disclaimers galore on the web site, but photocopied sheets and claims by upper level sellers that make specific, testable claims. Sorry quick reality check on a final sunflower comment .. The sun in Canada does not rise south east, for most of the year it rises north east. Being higher up on the earth than the equator we esseny see over the earths shoulders as the sun makes a wide sweep across the sky north east to north west.